Monday was the last day to submit comments on the draft version of an environmental report for a project to improve traffic congestion and air pollution along a stretch of the 710 (Long Beach) Freeway that includes Bell Gardens, Commerce and East Los Angeles. At a public meeting last Wednesday with the transportation agencies overseeing the project, resident after resident angrily said they are tired of not being listened to and their East Los Angeles neighborhoods being forced to absorb the brunt of the region’s transportation problems. 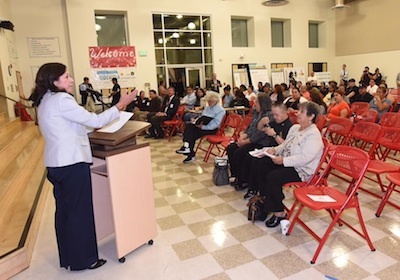 About 300 people attended the meeting Oct. 18 at Humphreys Avenue Elementary School hosted by Los Angeles County Supervisor Hilda Solis. The supervisor had arranged for the two lead agencies on the project, Caltrans and the Los Angeles County Metropolitan Transportation Authority (Metro), to answer questions related to the Recirculated Draft Environmental Impact Report for the I-710 Corridor Project that, among other things, includes the possible taking of some homes located along a stretch of the freeway in East Los Angeles. Solis represents neighborhoods and cities in the project area and sits on Metro’s Board of Directors. She briefly circulated among the crowd before the start of the meeting, which she opened by saying her office, Caltrans and Metro are committed to working with the community, but then left before the public comment portion of the meeting. Planning has been underway for years. The initial Draft EIR was circulated for public review in 2012. According to its Executive Summery, the Draft EIR currently under review was revised “Based on the feedback received during the 2012 public circulation period,” and changes in “key traffic conditions.” As a result, new building alternatives were added, according to the report. Eastside residents have long feared Caltrans and Metro would take homes in their neighborhoods for the project and the alternatives added show it could happen. If chosen, Options 3A and 3B under Alternatives 5 and 7 respectively, would hit residents on Sydney Drive in unincorporated East L.A. near the Commerce border the hardest. Dozens of homes could be slated for removal or the freeway widened to within a few feet of their front door step. Residents have been silent long enough, said Guadalupe Arellano, who has lived in East L.A. for 45 years. According to the presentation by Metro spokesman Ernesto Chavez, the I-710 project will improve traffic safety, air quality and prepare for growth in the goods movement. It would also improve public health by reducing air pollutants from trucks through the I-710 Clean Emissions Trucks Program. The damaging health impacts from the diesel trucks and cars traveling through the area have long been a concern, including among residents who are now protesting the plans that transportation officials say will improve air quality in the region. Andy Padilla, a 55-year resident of East L.A., angrily spoke about the injustice his community continues to deal with from government agencies. “It’s always the minority group that has to stand back,” Padilla said, noting that plans to expand the I-710 north through Pasadena and San Marino were scrapped because those more financially well-to-do communities didn’t want the disruption to their communities. “We have a voice, that’s our financial backing.” Padilla said. Funding to “alleviate project-related impacts to environmental justice communities” is recommended. Stories of pets dying, children having asthma and families fighting for their homes, circulated the auditorium before and after the meeting and during public testimony. Words of frustration, sorrow and tears of anger were expressed by residents, as some complained their supervisor and chief elected representative for the project had already left the room. Los Angeles Unified School District teacher Juan Vasquez leads the grassroots Sydney Drive Neighborhood Group, which has been very vocal about its opposition to the taking of homes in their neighborhood. He has also been critical of what he sees as Solis’ failure to engage directly with residents who could be displaced. “Where is she,” he said angrily after the meeting. At least half a dozen members of the supervisor’s staff were present during the meeting and actively engaged with the residents, responding to their inquiries and comments. Solis said in an email that her office facilitated last week’s public meeting to ensure maximum participation by the community. She said they secured the meeting location, headphones for simultaneous translations, note-takers and a court reporter to make sure comments were taken down accurately. Solis, who has yet to publicly endorse any of the proposals, also requested that Caltrans extend by 30 days the public comment period which was scheduled to end in September. For some in the community, however, those efforts aren’t good enough. The only thing they want to hear is that the supervisor will go to bat for them and stop to the project. “We are saying we don’t agree with any proposed alternative,” Vazquez emphasized. 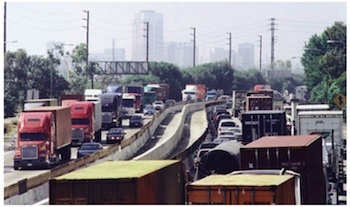 With so many communities impacted by the extreme traffic congestion and the unhealthful pollution it creates, not to mention the effect on the economy from the slowed-down movement of goods coming out of the Ports of Los Angeles and Long Beach, taking a position to do nothing is not without its own set of critics. At this point, however, according to Chavez the biggest obstacle to all of the proposals when it comes up for review in February 2018 is lack of funding. According to the I-710 Draft EIR, Alternative 5C would cost $6.5 billion to build while Alternative 7 would cost $11 billion. Metro and Caltrans will provide $1.2 billion towards funding, according to Chavez, leaving residents to question where the rest of the money will come from. Work will be done in stages, explained Chavez, meaning they don’t have to have all the money upfront. His words did not sit well with residents like Sylvia Corona, who complained her neighborhood would probably get the short end of stick. “The nicer areas get all the funding,” the 42-year resident of East L.A. warned her neighbors. EGP Managing Editor Gloria Alvarez contributed to this story.